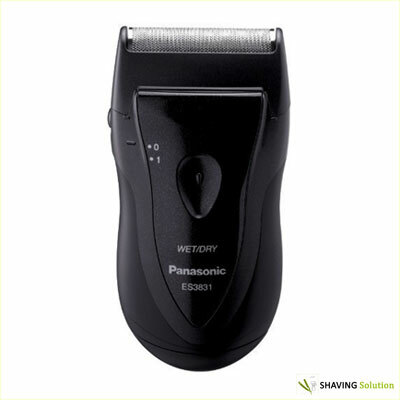 The Panasonic ES3831K Electric Travel Shaver is a men’s electric razor that does what it says. Lightweight and portable, it’s a basic entry-level model with generally good reviews.  Although it doesn’t have a load of features other than its 850 RPM motor and a little travel pouch, the Panasonic electric travel shaver offers great value for money at around $13-15. Moreover, its futuristic, edgy design makes it look like a much more expensive shaver. 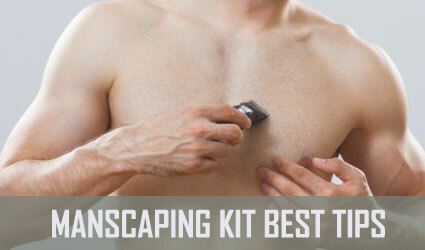 This machine is just a shaver, not a trimmer, but for men who have more extensive grooming needs, it can serve as an inexpensive back-up or may be useful when traveling. Its convenient size and the fact that it’s a battery-powered wet/drive shaver make it perfect for the busy guy who always oversleeps and has to shave in the shower. The blade is hypoallergenic and the foil is extra-thin, so even men with extremely sensitive skin may want to give this one a try. Plus, the straightforward design makes it great as a first-time razor for new shavers. Portability. Weighing in at 5.4 oz, this Panasonic shaver is a little over six inches in length, 2 inches thick, and just 4 inches wide. 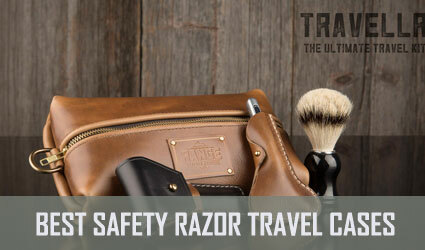 It’s suited for travel and great for men who like to shave in the shower. It also fits easily in any type of bag or luggage, and there’s no cord to lug around. This razor is also perfect for men with fast-growing facial hair who would like a mid-day shave at work or at the gym. Guys who drive a lot for work might even use it in their cars in between calls or jobs. Value. This razor gives you the type of shave you’d expect from a far more expensive machine. It compares favorably with other razors in the same price category, so it is a decent value for money all in all. In addition, many reviewers have noted it shaves really close for an inexpensive razor. So, if you have sensitive skin, go slow and be sure to use soap or cream. Easy to use. Panasonic ES3831K Electric Travel Shaver gears toward daily shavers who just need an electric shaver for their regular grooming needs. For these men, it makes more sense to get a good, inexpensive machine like this one than a razor with lots of confusing features. It’s also a breeze to care for. And, at this price, there is no need to replace the blade when it gets worn. You can just get another one. Also, the Panasonic is a great option for teenagers who are shaving for the first time. Especially considering the flexibility of both wet and dry options. Panasonic name. The company has an excellent reputation for making good consumer electrics and electronics and a long history, so you can’t beat this price for a Panasonic shaver. One possibility is to get this machine as a back-up. Also, if you are happy with it, upgrade the next time you are in the market for a more complete shaver. Cordless. No cord makes this no-frills model even easier to carry and travel with. It uses 2 AA batteries, which are not included. Wet/Dry. It’s a wet/dry shaver and fully immersible in water, making it a breeze to clean and allowing you to shave however you want. This Panasonic is truly designed to fit into your lifestyle. Not a trimmer. Men who are in the market for an all-in-one grooming machine or those with beards should probably look elsewhere. It also may not be the best choice for those who need to deal with nose hair. 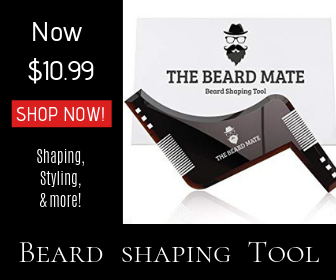 All in all, there aren’t many people for whom this will be a one-stop grooming solution. No cord. Yes, Panasonic ES3831K Electric Travel Shaver it’s great that the machine is cordless, but if the batteries die, you might just end up going to work with a five o’clock shadow. A corded option would be nice. Lack of accessories. With this razor, what you see is what you get. The machine comes with a travel pouch, cleaning brush, and plastic guard, and that’s it. Not the toughest machine. This is a nice little foil shaver. However, if you have a thick beard and finish shaving in two minutes with your Gillette razor, you might be disappointed. Some users have complained of not getting an even shave and having to go back a few times. Batteries wear down quickly. Since the machine doesn’t have a plug, you may end up buying new batteries every few weeks if you make this your daily shaver. This could add up quickly and make your machine much more expensive than one with a corded option. This Panasonic is a very bare-bones model. It comes with a travel pouch, cleaning brush, and head guard. 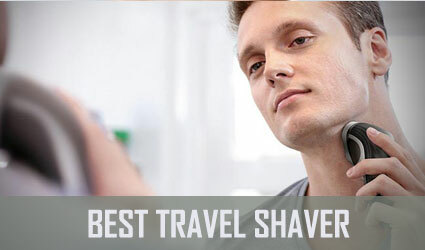 Reviews for the Panasonic electric travel shaver were for the most part very positive. Most users were pleased with the convenience of being able to shave wet or dry. They also praised the close shave they got from the razor. However, there were a few detractors. Most users who were disappointed in the machine’s performance said the machine isn’t suited for users with very coarse hair. They find themselves making several passes and not getting a uniform shave. 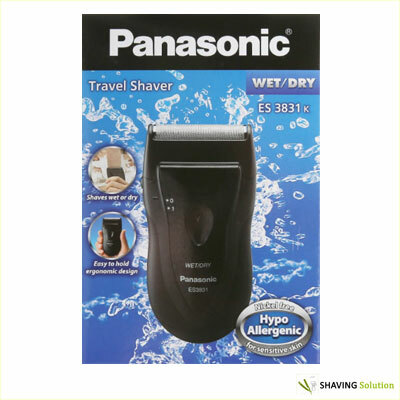 The Panasonic ES3831K Electric Travel Shaver is a convenient and inexpensive solution for many, but it isn’t for everyone. Men who need to trim facial hair or do other grooming, or with extremely thick facial hair, may find this machine not meeting their needs. However, for those shopping for a back-up machine or a shaver to use while traveling, this razor fits the bill nicely.